In the Keyword Optimization feature, you can modify your keyword string with Keyword Optimization. To efficiently use the characters allowed by the App Store for keywords, you can insert a string of keywords and easily see how many characters you have left. Sensor Tower will inform you whether a keyword is good to use (green), not needed, e.g., plurals (yellow), or should be removed, e.g., already in the app title (red). In Keyword Optimization, you can also click on “Track keyword” to begin tracking the ones you are not currently monitoring in Keyword Rankings. 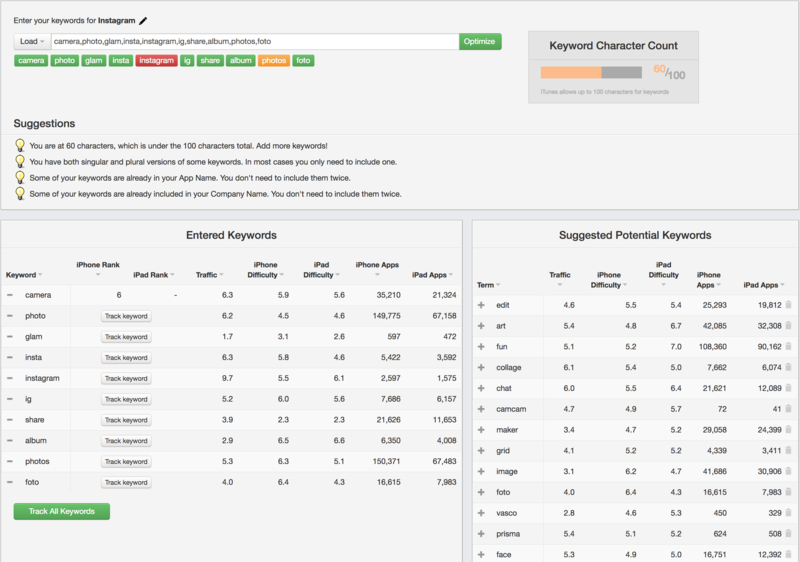 From our Keyword Suggestions feature, you will see a list of Suggested Potential Keywords that provides you with a list of potential new keywords as well as keyword suggestions to help you refine your keyword string. You can track the keywords within your keyword string in Keyword Rankings by clicking on Track Keyword. Note that this module is only available for iOS apps.